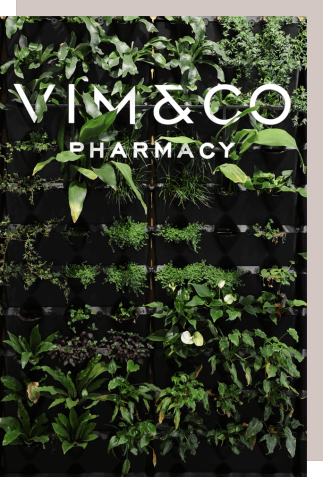 Vim & Co isn't like any other pharmacy you've ever visited before, and it's because we're doing pharmacy differently. It goes beyond just prescriptions and medications. Not just for when you’re sick. From the moment you arrive at our Northbridge Pharmacy, you are greeted by real people who provide a real service. We’re a bricks and mortar store in Northbridge Perth, Australia. So you can step inside, touch, feel and smell the products for yourself. The pharmacy has been architecturally designed to create a soothing, nurturing ambience, just for you. At Vim & Co, we go to extraordinary lengths to find the right products for you, using our knowledge and expertise in health sciences. We source only the best, because your health is not worthy of anything less. To access the healthiest you, we present you a selection of brands that share the same values, and who offer products that are helpful, not harmful. The Vim & Co product family is built on trust, quality, guarantee and curation. We search far and wide to find the right mix of brands for all your product needs across health, pharmacy, family and beauty. Now you only need to look in one place- to explore what we’ve selected especially for you. Just think of your life, but with more vitality and energy behind you- Imagine what you could accomplish and the adventure you could pursue. The Vim & Co pharmacy model is built on three pillars that we call the Wellness Triangle – Symptoms, Prevention and Education. First and foremost, we treat symptoms. Treating your immediate discomfort is vital. We believe in empowering you with the right education and tools to take control of your health, so you can go beyond prevention and actually improve your health - so you keep getting better. Beyond just symptom relief, we'll talk to you about how to prevent the symptoms recurring, so you don't have to feel uncomfortable again. It’s simple, we want you to LOVE coming into the pharmacy. Our goal is to provide you genuine healthcare advice with quality health & beauty products in a beautifully stimulating environment, creating a new kind of healthcare experience. Welcome to Vim and Co. The new vision of pharmacy.